"The seasonal treat that inspires strong feelings - love 'em or hate 'em - in a boozy shot form. This version goes for a triple shot, so shoot responsibly. 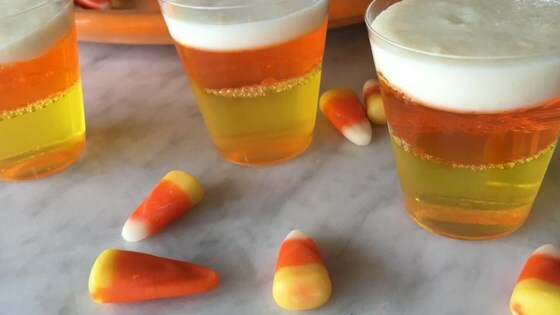 Serve with candy corn on the side. Cheers!" Pour 3/4 cup boiling water into a small bowl. Add lemon gelatin mix; stir until dissolved. Pour 1 cup vodka into a glass measuring cup; add enough ice to make 1 1/4 cup. Stir into lemon gelatin until slightly thickened; remove any unmelted ice. Fill tall shot glasses 1/3 of the way with lemon gelatin mixture. Refrigerate until lemon gelatin layer is set, at least 90 minutes. Pour remaining 3/4 cup boiling water into the small bowl. Add orange gelatin mix; stir until dissolved. Pour remaining 1 cup vodka into a glass measuring cup; add enough ice to make 1 1/4 cup. Stir into orange gelatin until slightly thickened; remove any unmelted ice. Pour over lemon gelatin layer. Refrigerate until orange gelatin layer is set, at least 90 minutes. Pour 2 tablespoons warm water into a bowl. Add unflavored gelatin; stir until dissolved. Stir in condensed milk and rum. Pour over orange gelatin layer. Refrigerate until top layer is set, at least 30 minutes. See how to super-fun watermelon Jell-O shots. They’re cute with a kick! Tall shot glasses are available at specialty stores or online. Our guests were so impressed and thought they were quite good! The yellow and orange were very strong and the top layer never set. I'm making again but trying a little less alchohol. I'm try 3/4 instead of a cup each.